Different types of cooking call for different cookware materials. For instance, you’ll get better results when you brown or braise foods in stainless steel, while baking is best done in cast iron. Buying quality pots and pans is one of the best things you can do to up your cooking game. Whether you're setting up your kitchen for the first time or looking for an upgrade, consider buying a cookware set, which can save you money over buying each piece separately. You can always add specialty pieces if and when you need them. A great starter cookware set will generally include two skillets (10-inch and 12-inch), two saucepans (1.5-quart and 3-quart), a sauté pan with a lid, and a stockpot. Cookware sets come in a range of materials, the most common being aluminum or nonstick-coated aluminum and stainless steel. Aluminum is the least expensive choice. It conducts heat well but is easily scratched or dented, and it may react with acidic foods. Anodized aluminum has a scratch-resistant, non-leaching surface. Nonstick-coated aluminum is a breeze to clean, but it's prone to scratching and may leach into food. Nonstick coated cookware needs to be replaced every few years. Stainless steel is pricier than aluminum, but it's also more durable and won't leach into food. If well cared for, stainless steel cookware can last for many years. Other considerations you'll want to keep in mind when choosing a cookware set include temperature limitations (some are only safe up to 350ºF; others can withstand much higher temps) and whether the pieces are oven-safe and have tight-fitting lids. Q. Are nonstick coatings safe? A. While it is true that nonstick-coated cookware can release toxic chemicals when heated to very high heat, risk is minimized by following proper usage guidelines, such as not preheating the pans when empty and not using them to cook on high heat. Q. Is some cookware dishwasher safe? A. Some cookware might carry a dishwasher-safe label, but handwashing is always the best way to care for your cookware. This is especially true of cookware with a nonstick coating, since the repeated dishwasher exposure can wear away the coating. Our take: A high-quality cookware set that will last a lifetime. What we like: It's got a three-layer construction that makes it sturdy and a great heat conductor, has a stainless steel surface, and can be used on any cooktop. What we dislike: It's pricey, and the handles get hot during use. Our take: Professional quality cookware at a price a home cook can afford. What we like: Tight-fitting lids and a mirror-shine stainless steel surface. What we dislike: May warp when used on a glass cooktop. Our take: Decent quality cookware at a decent price. What we like: Hard-anodized aluminum construction gives it great heat conductivity. It is oven-safe up to 450ºF and has stay-cool handles. What we dislike: Can't be used on magnetic induction stovetops, and the nonstick coating makes it unsuitable for broiler use. Robin Donovan is a writer for BestReviews. 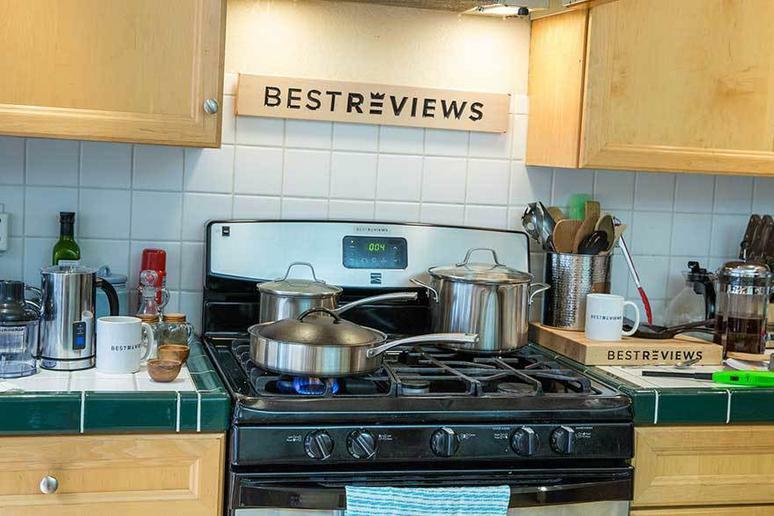 BestReviews is a product review company with a singular mission: to help simplify your purchasing decisions and save you time and money. BestReviews never accepts free products from manufacturers and purchases every product it reviews with its own funds.